Danny Kingston serves up his Greek semolina cake, Revani, a recipe that he has tweaked to perfection over the years. 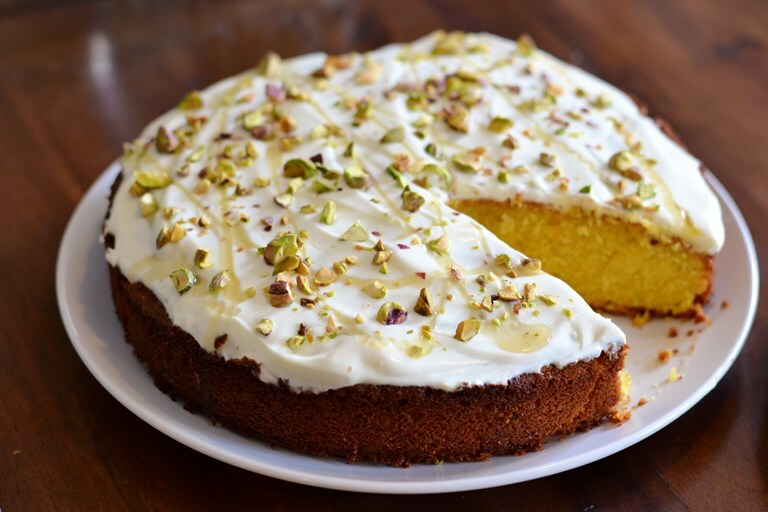 The heady combination of honey, orange and pistachio is sure to bring a slice of Greek sunshine to your kitchen. Most traditional recipes, like this Greek semolina cake (or Revani as it is also known), are all open to interpretation, tweaks and additions and this recipe is no different. And whilst I wish I could say that I learnt to make this under the guidance of a scary Yiayia, all clad in black, I got the lowdown for this wonderfully moreish cake from another maternal figure; namely, the very reliable Delia Smith. But then again, she didn’t quite get it right the first time around because my first attempt way back when fractured under the pressure when I tried to lift it out of the tin and I was largely left with crumbs. This could be down to my own cack-handed ineptitude of course but being the stubborn, pig-headed type, I am hardly going to foot the blame. So after further cracks at the whip, I’ve made a couple of changes by adding a smidgen of breadcrumb and soupçon of oil to the mix, just to stabilise things. There be might frowns, certainly; but let me reassure you, the grainy texture and lightness of this cake, imbued with sweet honey and citrus, is by no way affected by their introduction. Yes, I am talking to you, my imaginary Greek grandmother. As for Delia, I am sure she won’t be too bothered.